Welcome, Feltish Mortals <—ha! 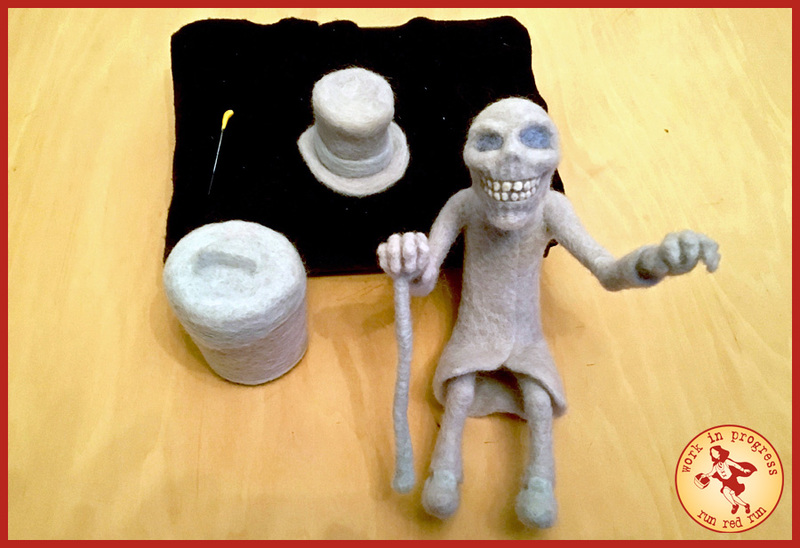 Fans of Disneyland’s Haunted Mansion might recognize my latest felted ghoul. 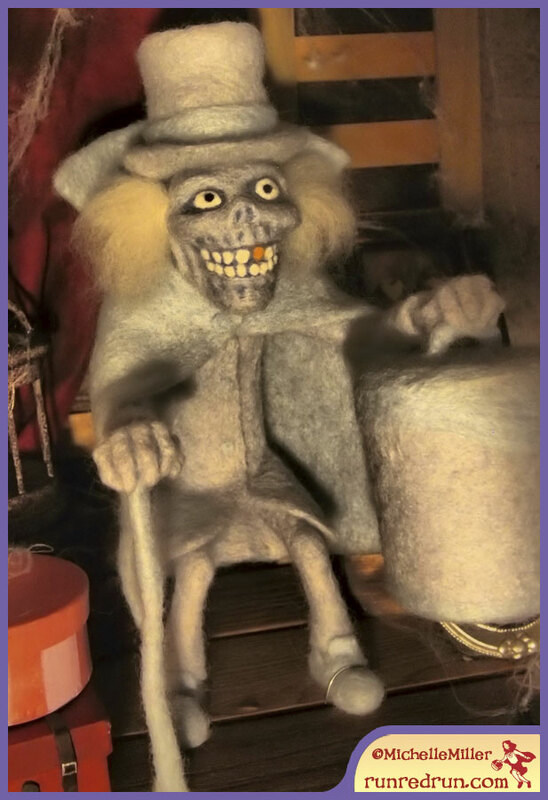 It’s the mysterious Hatbox Ghost, a long-rumored-but-rarely-seen denizen of the creepy old attic in that classic attraction. The ghost recently returned to the Haunted Mansion at Disneyland, and I wanted to celebrate by creating this tribute. This time I decided to go beyond the felted figure and build a cobwebbed attic corner for him to haunt as well. 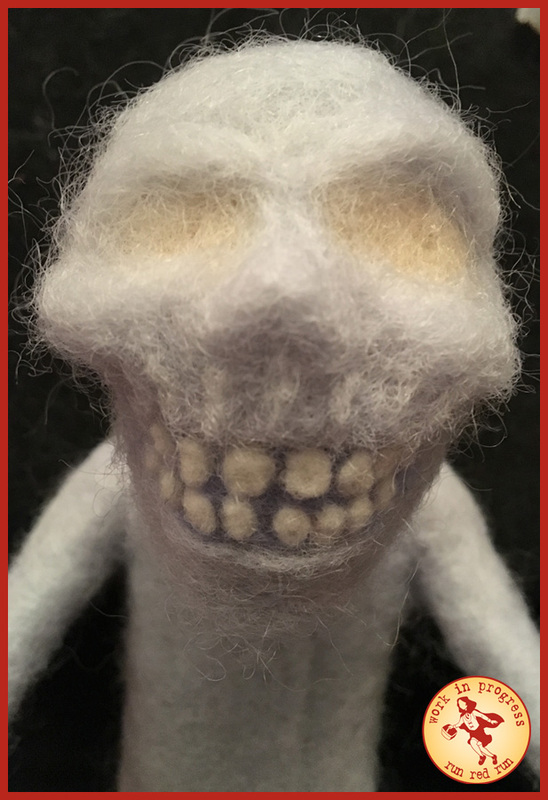 There are more photos of the finished piece in my gallery, but if you’re interested in how I brought this happy haunt to the life (er…afterlife), I’ve posted a pretty comprehensive step-by-step below. 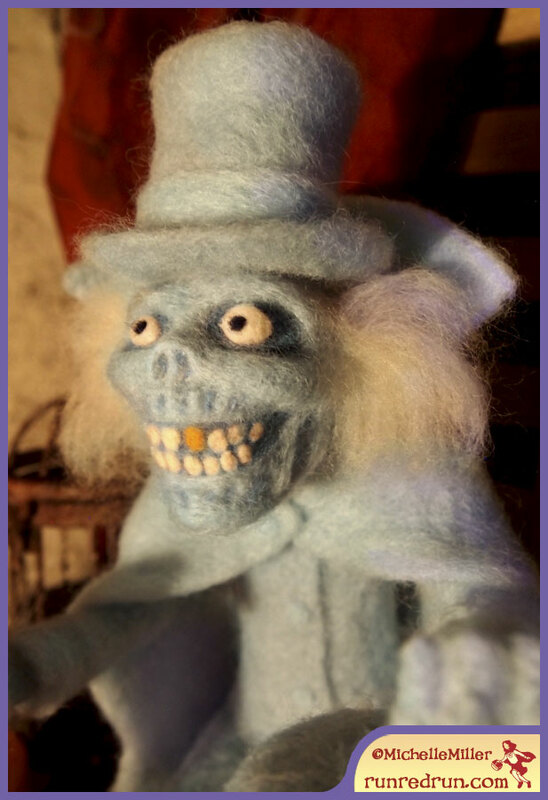 It’s a pretty massive “ghost post” so settle into your doom buggy and let me guide you through my process. 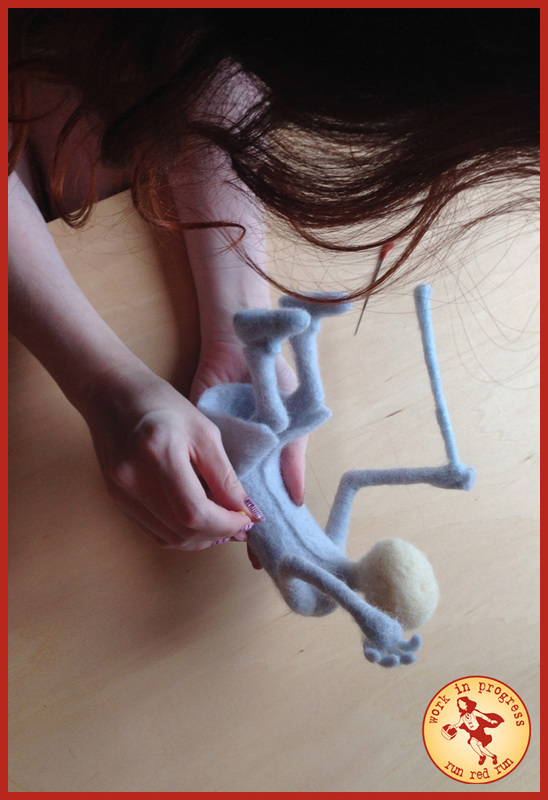 I started with a wire armature to give the ghost stability and make him posable. 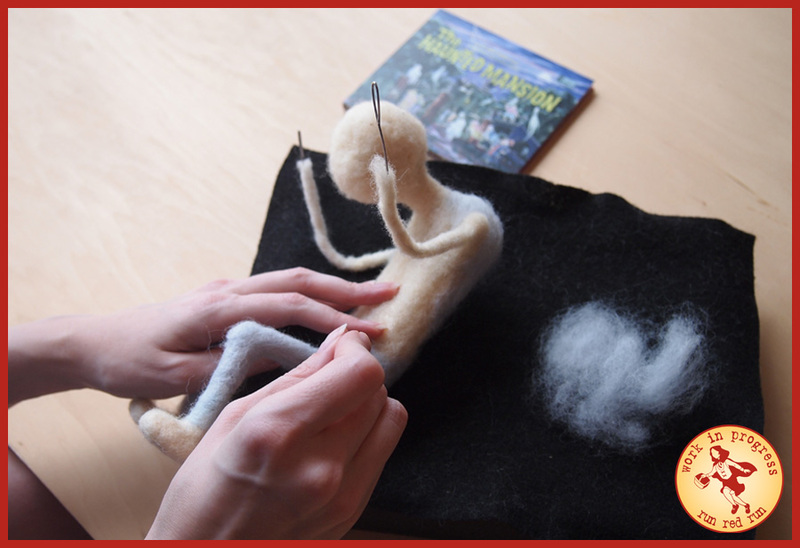 As the wire was covered with core wool he started taking shape — like some kind of weird monster or a Picasso. 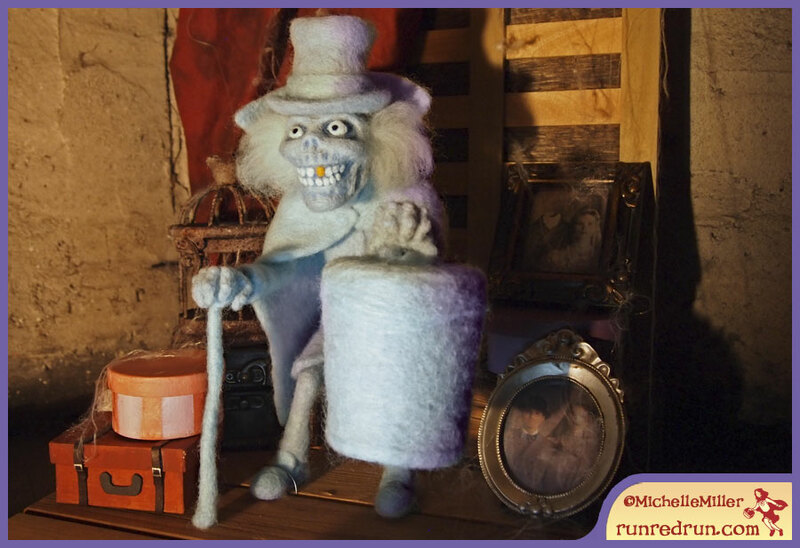 I slid the Haunted Mansion Story & Song CD into the player to set the mood, and began adding the blue wool for his skin and clothes. To get the colors I wanted for this I had to order a wool that I don’t normally use and it was a little tougher to work with. 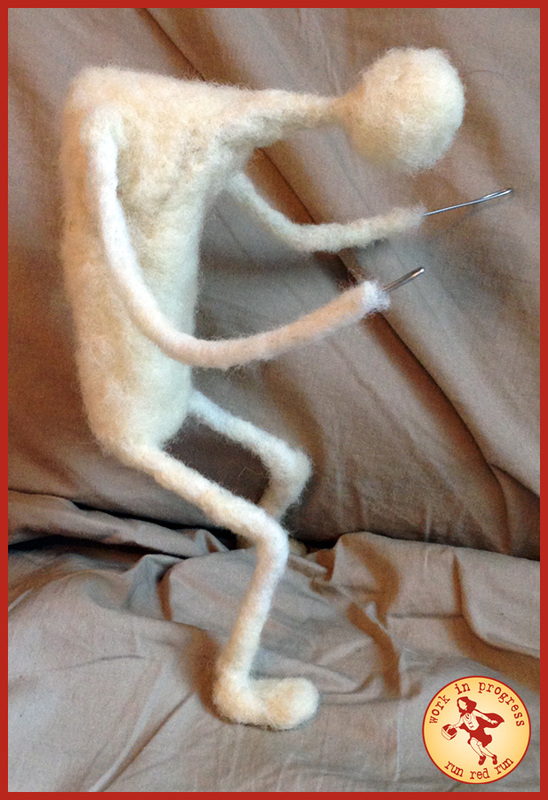 It took longer to felt and ended up a little fuzzier than I like, but the colors were perfect for a felted ghost. I got most of the body done before starting on his creepy face. 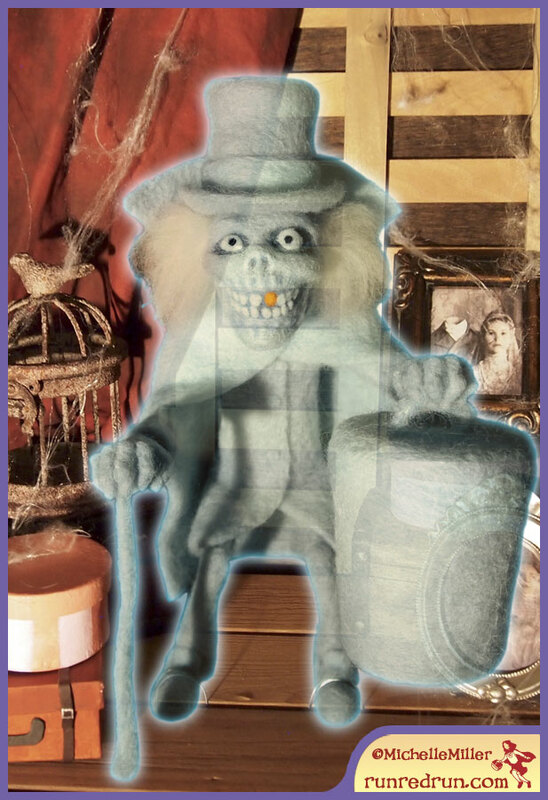 The ghost, his hatbox and top hat. Some parts and pieces coming together. As I mentioned earlier, I wanted an environment for the ghost to haunt, so I asked some friends to help me put together the attic set. I wasn’t aiming for an exact duplicate of the Haunted Mansion attic, just something that evoked that same feeling of creepy clutter. 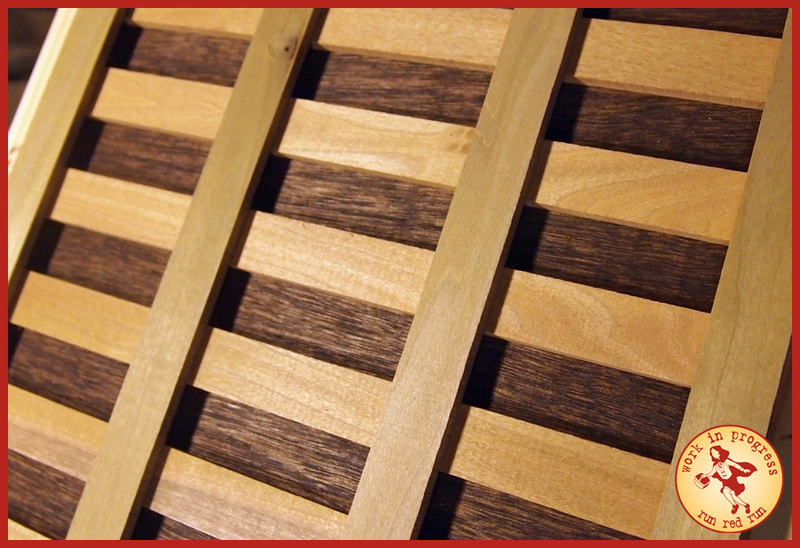 A friend (who, unlike me, knows what he’s doing with woodworking tools) cut strips of wood to replicate the look of vintage roof lattice. 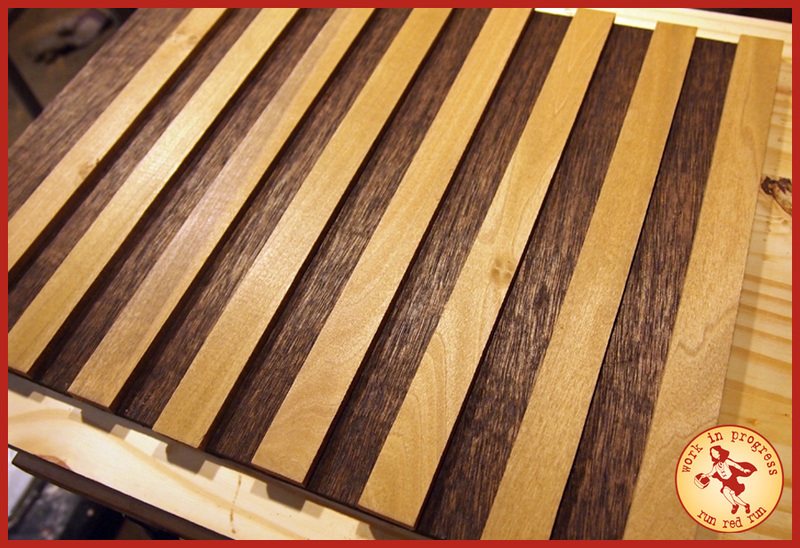 Then we stained the wood (three different colors to add depth) and glued it all together. 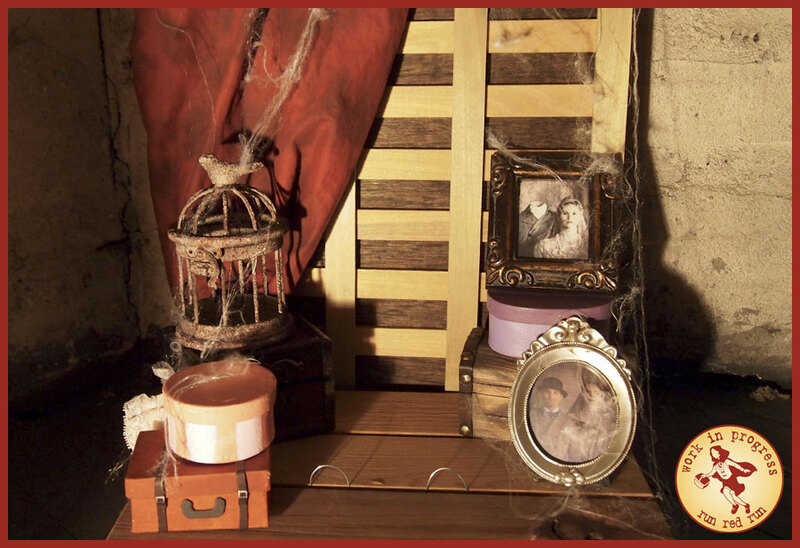 We also collected and built props to create the perfect haunt. 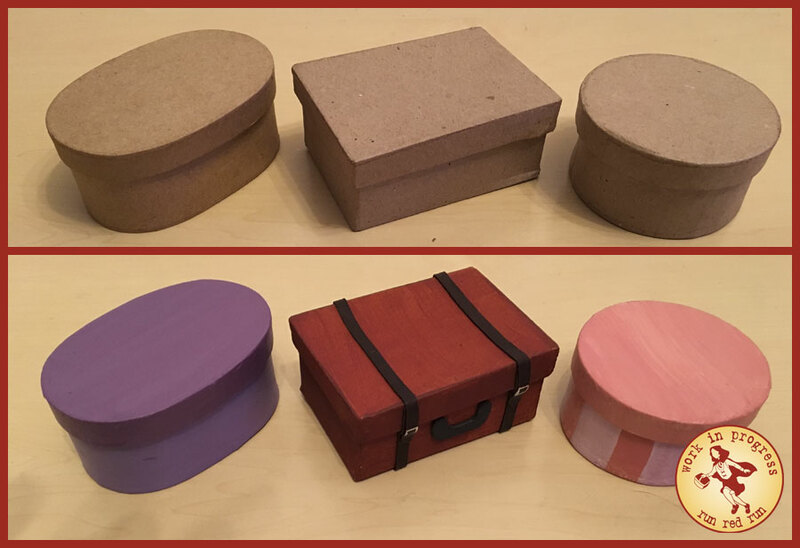 Papier-mache boxes were bought and fashioned into hat boxes and a suitcase. We painted them and used craft foam to give the suitcase some old-timey straps and a handle. We also rummaged through craft store shelves to find tiny antique-looking frames. I found some images of the actual portraits that collect dust in the Haunted Mansion’s attic, printed them to size, and slipped them into the frames. A few trunks (one with a Barbie wedding dress hanging out) and curious objects (like that rusty birdcage) festooned with some leftover Halloween cobwebs and the attic scene is done. Check my gallery for more photos of the finished piece.